A few statements regarding these phenomena, in response to a request of the Electrical Experimenter, may be useful at the present time in view of the increasing interest and importance of the subject. The commercial application of the art has led to the construction of larger transmitters and multiplication of their number, greater distances had to be covered and it became imperative to employ receiving devices of ever increasing sensitiveness. All these and other changes have cooperated in emphasizing the trouble and seriously impairing the reliability and value of the plants. To such a degree has this been the case that conservative business men and financiers have come to look upon this method of conveying intelligence as one offering but very limited possibilities, and the Government has deemed it advisable to assume control. This unfortunate state of affairs, fatal to enlistment of capital and healthful competitive development, could have been avoided had electricians not remained to this day under the spell of a delusive theory and had the practical exploiters of this advance not permitted enterprise to outrun technical competence. 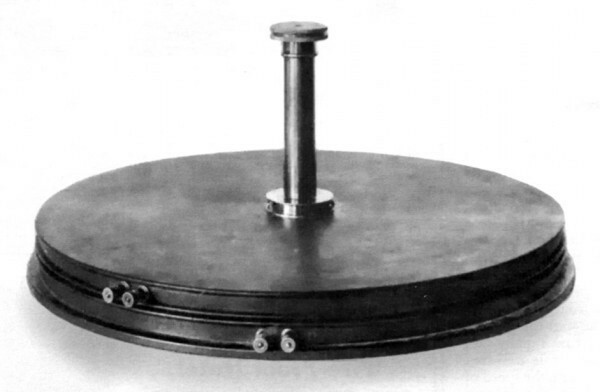 With the publication of Dr. Heinrich Hertz’s classical researches it was an obvious inference that the dark rays investigated by him could be used for signalling purposes, as those of light in heliography, and the first steps in this direction were made with his apparatus which, in 1896, was found capable of actuating receivers at a distance of a few miles. Three years prior to this, however, in lectures before the Franklin Institute and National Electric Light Association, I had described a wireless system radically opposite to the Hertzian in principle inasmuch as it depended on currents conducted thru the earth instead of on radiations propagated thru the atmosphere, presumably in straight lines. The apparatus then outlined by me consisted of a transmitter comprising a primary circuit excited from an alternator or equivalent source of electrical energy and a high potential secondary resonant circuit, connected with its terminals to ground and to an elevated capacity, and a similar tuned receiving circuit including the operative device. On that occasion I exprest myself confidently on the feasibility of flashing in this manner not only signals to any terrestrial distance but transmitting power in unlimited amounts for all sorts of industrial purposes. The discoveries made and experimental results attained I made with a wireless power-plant erected in 1899, some of which were disclosed in the Century Magazine of June, 1900, and several U. S. patents subsequently granted to me have, I believe, borne-out strikingly my foresight. In the meantime the Hertzian arrangements were gradually modified, one feature after another being abandoned, so that now not a vestige of them can be found and my system of four tuned circuits has been universally adopted, not only in its fundamentals but in every detail as the “quenched sparks”, “ticker”, “tone wheel”, high frequency and rotating field alternators, forms of discharges and mercury breaks, frequency changers, coils, condensers, regulating methods and devices, etc. This fact would give me supreme satisfaction were it not that the engineers, misinterpreting the nature of the effects, are making installments so defective in construction and mode of operation as to preclude the possibility of the great realization which might be brought within easy reach by proper application of the underlying principles and one of which — the most desirable at present — is the complete elimination of all static and other interference. During the past few years several emphatic announcements have been made that a perfect solution of this problem had been discovered, but it was manifest from a casual perusal of these publications that the experts were ignoring certain truths of vital bearing on the question, and so long as this was the case no such claim could be substantiated. I achieved early success by keeping these steadily in mind and applying my efforts from the outset in the right and correct scientific direction. I may contribute to the clearness of the subject in answering a question which I have been asked by the Editors of the Electrical Experimenter with reference to the report contained in the last issue, that signals had been received around the globe, an achievement the practicability of which I have fully demonstrated by experiment eighteen years ago. The question is, how can Hertz waves be conveyed to such a distance in view of the curvature of the earth? A few words will be sufficient to show the absurdity of the prevailing opinion propounded in text books. We are living on a conducting globe surrounded by a thin layer of insulating air, above which is a rarefied and conducting atmosphere. If the earth is represented by a sphere of 12½” radius, then the layer which may be considered insulating for high frequency currents of great tension is less than 1/64 of an inch thick. It is held that the Hertz waves, emanating from a transmitter, get to the distant receiver by successive reflections. The utter impossibility of this will be evident when it is shown by a simple calculation that the amount of energy received, even if it could be collected in its totality, is infinitesimal and would not actuate the most sensitive instrument known were it magnified many million times. The fact is these waves have no perceptible influence on a receiver if situated at a much smaller distance. It should be remembered, moreover, that since the first attempts the wave lengths have been increased until those advocated by me were adopted, in which this form of radiation has been reduced to one-billionth. When a circuit, connected to ground and to an elevated capacity oscillates, two effects separate and distinct are produced; Hertz waves are radiated in a direction at right angles to the axis of symmetry of the conductor, and simultaneously a current is passed through the earth. The former propagates with the speed of light, the latter with a velocity proportionate to the cosecant of an angle which from the origin to the opposite point of the globe varies from zero to 180°. Expressed in words, at the start the speed is infinite and diminishes, first rapidly and then slowly until a quadrant is traversed when the current proceeds with the speed of light. From that region on the velocity gradually increases, becoming infinite at the opposite point of the globe. In a patent granted to me in April, 1905, I have summed up this law of propagation in the statement that the projections of all half waves on the axis of symmetry of movement are equal, which means that the successive half waves, tho of different length, cover exactly the same area. In the near future many wonderful results will be obtained by taking advantage of this fact. There is a vast difference between these two forms of wave movement in their bearing on the transmission. The Hertz waves represent energy which is radiated and unrecoverable. The current energy, on the other hand, is preserved and can be recovered theoretically, at least, in its entirety. If the experts will free themselves from the illusions under which they are laboring, they will find that to overcome static disturbances all that is needed is a properly constructed transmitter and receiver without any additional devices or preventives. I have, however, devised several forms of apparatus eliminating statics even in the present defective wireless installations in which they are magnified many times. Such a form of instrument which I have used successfully is shown in the annexed photograph. These phenomena have been studied by me for a number of years and I have found that there are nine or ten different causes tending to intensify them, and in due course I shall give a full description of the various improvements I have made, in the Electrical Experimenter. For the present I would only point out that in order to perfectly eliminate the static interference, it is indispensable to redesign the whole wireless apparatus as now employed. The sooner this is understood the better it will be for the further evolution of the Art.